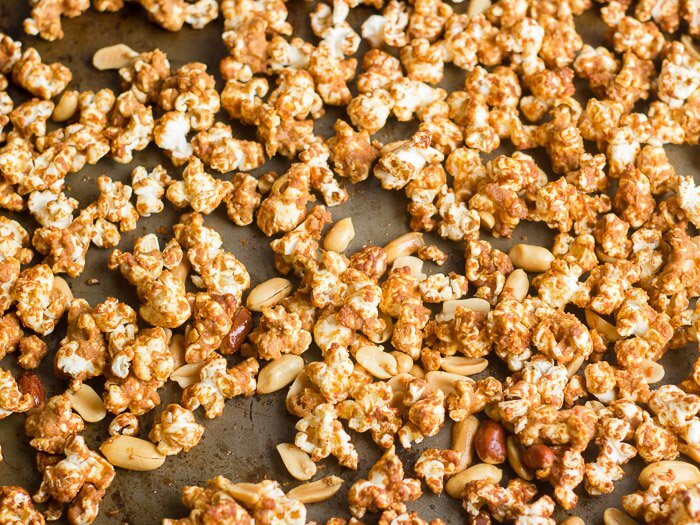 This addictive caramel corn is drenched in a peanut butter coating that’s rich and nutty, perfectly sweet, and just a tad spicy! Sometimes, especially this time of year, my husband and I like to spend a weekend evening watching a movie on the couch. It’s just nice to cozy up and escape for a few hours when it’s freezing cold outside! We’re both kind of behind on what’s new and worth watching in the world of film though, and a good deal of the time we end up catching some flick from the mid-nineties that we both happened to miss. (We’re old!) It’s hard to stay on top of things when you stream most of your television—you end up missing all the commercials that would otherwise get you psyched up for upcoming releases. Also, did I mention that the last year has been all kinds of crazy busy? That certainly doesn’t help! We came up with a solution: in lieu of a weekend movie date night, we’re going to have a weekend awards show date night. That should get us caught up on everything from the last year. And since we’re dealing with movies that are all at least nominated for awards, we should end up with a nice little list of guaranteed hits for future movie nights, right? You can’t have movie night, or in this case award show night, without some snacks though, so I felt compelled to whip up something special. With the idea of movie snacks in mind, there’s all kinds of directions I could take this one: sweet, salty and crunchy, spicy, or even rich and indulgent. I decided to go for all of the above. Spicy peanut butter caramel corn it is! 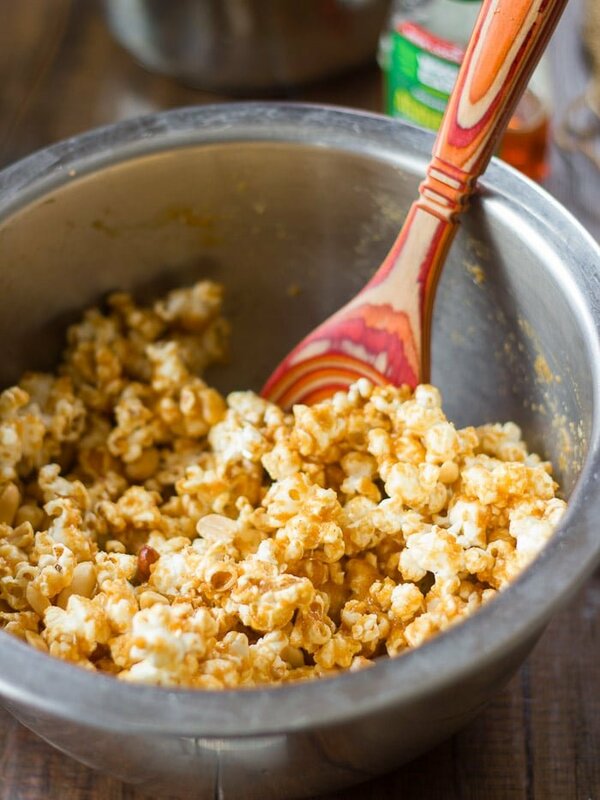 Because popcorn is the ultimate movie snack, and since I wanted to go all out for our special date night, I added some sweetness, peanut butter, and cayenne pepper for a kick! You’ve probably guessed that this is a pretty indulgent one, and it is—but not as indulgent as you’d think. 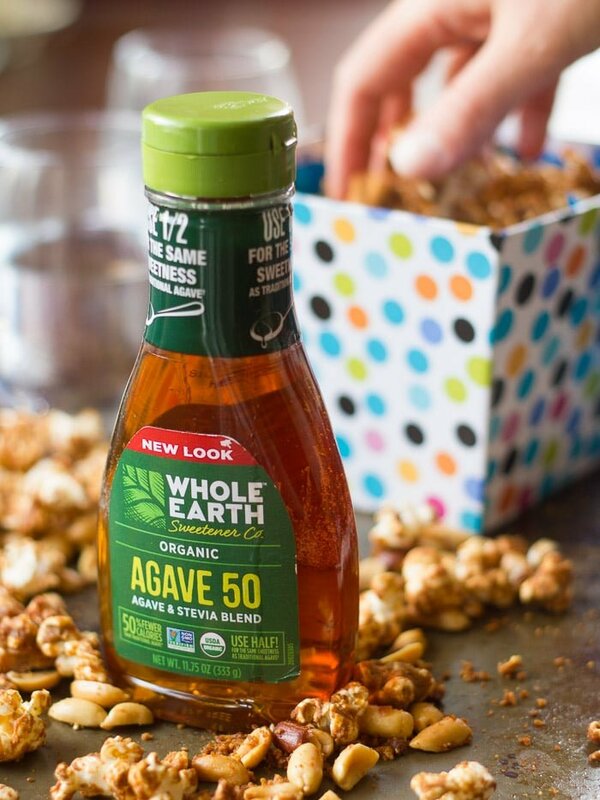 I sweetened up this caramel corn with Whole Earth Sweetener Agave 50. I needed a liquid sweetener to get my peanut butter coating just the right consistency, and since the Agave 50 is a blend of agave and stevia, it has half the calories per serving of traditional agave. This popcorn is addictive, so I welcome the chance to slash a few calories! My local supermarket carries Whole Earth Sweetener Agave 50, right in the baking aisle with the other sweeteners and Whole Earth Sweetener products. My peanut butter caramel corn turned out delicious! It was sweet, crunchy, loaded with flavor, and spicy, but not too spicy. Feel free to up the cayenne content if you’d like something with a real kick. 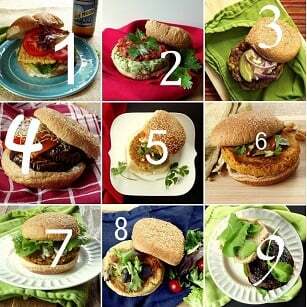 If you’re planning on making an event of award show-watching and need some more snack inspiration, check out the Whole Earth Sweetener Facebook page—they’ve got lots of ideas! 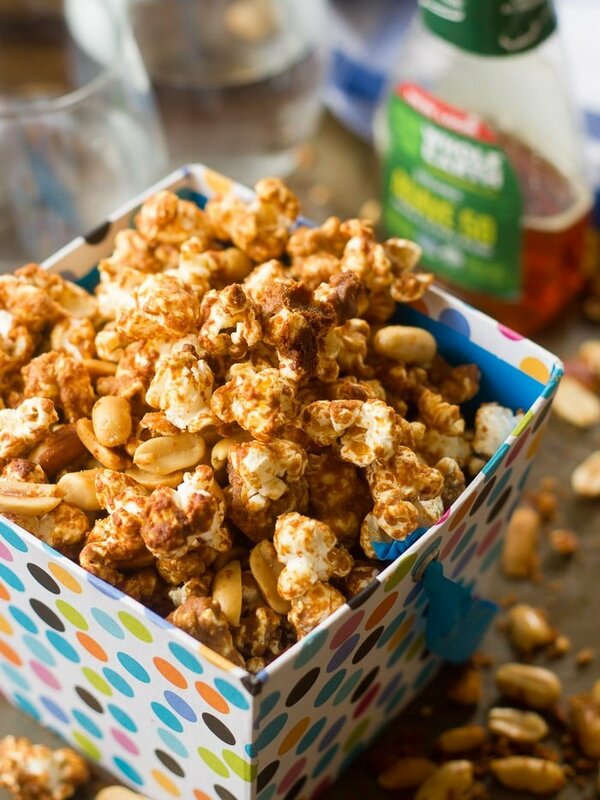 This addictive caramel corn is drenched in a peanut butter coating that's rich and nutty, perfectly sweet, and just a tad spicy! Preheat the oven to 225°. Place the popcorn into a large mixing bowl. Place the butter, Whole Earth Sweetener Agave 50, vanilla extract, cayenne pepper, and salt into a small saucepan, and set it over medium heat. Whisk the ingredients together as the butter melts. 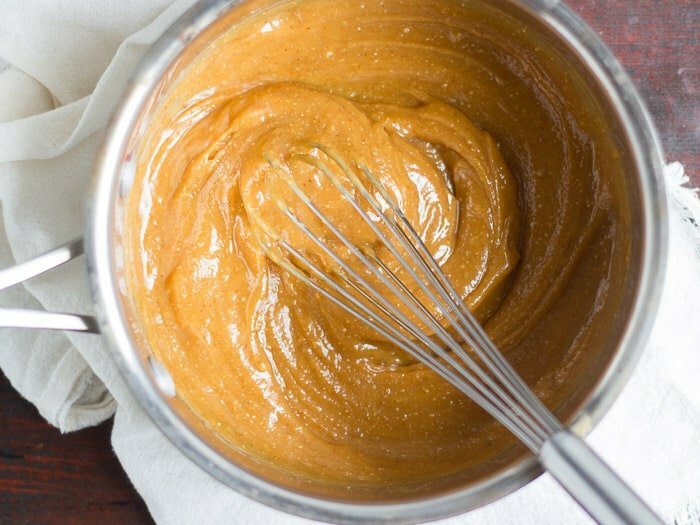 Once the ingredients are fully blended, remove the saucepan from the heat and quickly whisk in the peanut butter. Immediately pour the mixture over the popcorn. Add the peanuts and toss everything with a spoon and/or your hands to fully coat the popcorn and peanuts in the peanut butter mixture. 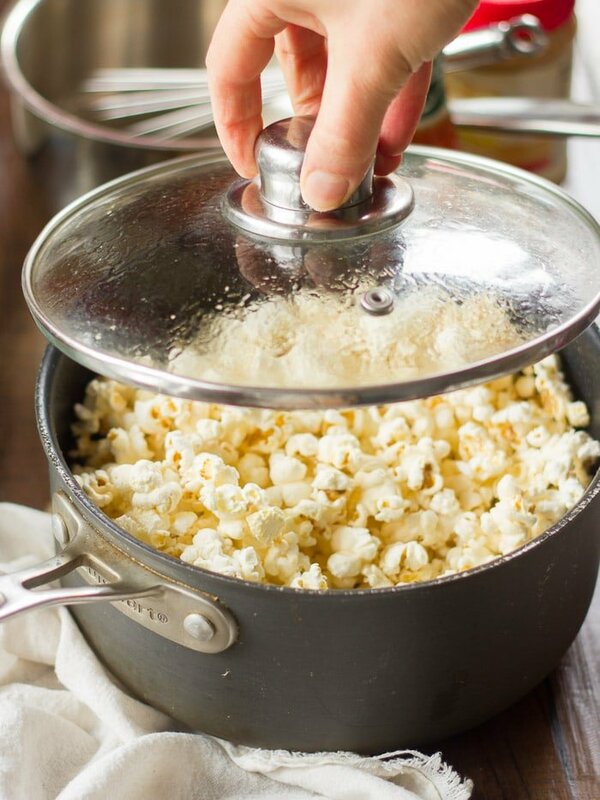 Arrange the popcorn in an even layer on a baking sheet, then place it into the oven and bake until the coating begins to darken, about 30 minutes. Remove from the oven and allow to cool. Serve. OMG. I want it all! Perfect for a night on the couch re-watching Oscar winners, amirite? I’m super intrigued by the whole sweet and spicy popcorn idea – of course I’ve had sweet + spicy with some dinner dishes, but never in popcorn! I have to say it seems like you can’t really go wrong – I mean, peanut butter is SO addictive and I love spicy food, so I’m sure I’d love this!! Such a fun snack for movie night, or as you mentioned, awards show snacking! It looks awesome, Alissa, can’t wait to try it! Thanks Sara! I hope you enjoy it!